Waku Waku Sonic Patrol Car © 1991 Sega Enterprises, Limited. On your permanently set northward journey, you can avoid cars by moving left and right. You can also jump out the car (after which you land right back in), but the only use for this feature is to defeat Eggman. The two-minute story plays out in the course of the action: officer Sonic heads out from the station and hits the streets, on what appears to be a routine patrol. (On the way, you encounter a traffic light and must stop to let Flicky and the gang pass.) During the patrol, you spot Doctor Eggman pushing cars off the street in a vehicle of his own. The chase begins! Doctor Eggman can be taken out with a few spins; just watch out for the bombs he's chucking at you. Whether you defeat him or not, Sonic eventually drives in to another police station and says something to you in Japanese. 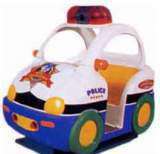 Waku Waku Sonic Patrol Car was released in November 1991 in Japan. This representes one of the first ever appearances of Sonic the Hedgehog in the arcades.